The pay gap between low and high earners in the UK is growing. 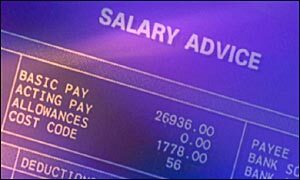 A report out on Monday by pay analysts Incomes Data Services said an increasing number of UK workers were receiving less than average earnings. By 2002, almost two-thirds of UK workers were making less than the national weekly average of £465 a week. In the past decade, top earners have enjoyed bigger pay increases than workers in the lowest wage bracket. This has increased the average earnings figures, leaving a growing number of workers below the average. The report said this trend has been particularly strong since Labour came into power in 1997. Over the past 10 years, the pay of the top earning 10% of employees has grown by almost 54%, while the lowest 10% have seen their earnings rise by only 45%. Although the national minimum wage had improved earnings for the lower paid since it was introduced in 1999, the report said it had had "little impact on the growth in overall earnings inequality". The gap between the top and bottom earners has increased at a faster rate among men, partly because of big money being made by senior managers and finance professionals, mostly men, working in London's financial heart. Over the past year, pay deals have been stable, ranging between 2% and 3% in most private firms and between 3% and 4.5% in the public sector, the report found.